Do you feel stuck? Stuck feeling angry, or depressed, or unsure of the way forward? Do you find it difficult to see the options and possibilities, and find it challenging to decide what is the best way forward? Divorce is described by experts as the second most stressful life event, after the death of a loved one. It’s no wonder people are stuck and in pain. There is a grieving process to go through. In 1969, psychologist Elizabeth Kubler Ross outlined 5 stages to grief: denial, anger, bargaining, depression and acceptance. As you move through grief, you are likely to visit all of these stages, for varying lengths of time. You might circle through them, and move backwards and forwards between them. Everyone deals with grief differently. Please let me reassure you - all of this is completely normal. I often see people who are stuck in one or two stages of the cycle. I know that it can be exhausting and painful. My clients often ask what they can do to move more quickly through these stages. · Concentrate on moving forward positively. You are the only person who is responsible for your life. You have the power to consciously move your life forward in a way that you choose. When everything around you is shifting, as it does in a divorce, I understand this can be frightening. It can feel like things are happening to you. So start with baby steps, and focus on you. Lots of small steps add up to massive leaps forward over time. You may be surprised by how a simple change, like a new duvet set on your bed, or shopping in a new supermarket that doesn’t hold memories of your weekly shop with your ex, can change your mindset. Start doing something kind for yourself every day, to shift your focus on to you, and your recovery. Get clarity on the options you have. It will give you power. There will be things that scare you as you go through your divorce. This is normal. Many of my clients say that they are afraid because they don’t know what their future holds. If you can get clarity on your options, that will give you power. Don’t stick your head in the sand about the things that are scaring you, whether that be your financial situation, where you will live, or what shared care for your children might look like. Instead, find out all you can about the things that worry you. Knowledge is power, and having knowledge helps to reduce overwhelm. Work out what you can control, and what you can’t. Focus on the things you can control. Don’t waste valuable energy worrying about things you can do nothing about. Channel that energy elsewhere. Many clients tell me that they can’t control their feelings, that their negative feelings are just too much. I can help you to dial down those negative feelings, so that you can begin to handle them better. I can help you identify repeated behaviour patterns that give you the same negative feelings every time, and change those behaviours, to get a different result. Where your focus goes, so your energy flows. What you think about and focus on will influence your actions and results. If you focus on your ex and his new girlfriend, and follow them on Facebook, you will feed the negative feelings you have about them. If you switch your focus onto YOU, what you enjoy, what you like to do, and what you need, your energy will follow. If you focus on the past, and ask yourself why, your brain will try to answer that question. It will look for answers to negative questions. Instead, ask yourself more empowering questions – what can I do to make this better? Who could help me? What could I do to improve my mood today? What else could I try to get a different result? What’s the best (and worst) that could happen? Do I still want to feel like this in 6 months/a year’s time? What can I do to shift those feelings? Notice how often you tell your breakup story, and notice the sorts of words you use when you tell it. If you keep telling the same sad story, your brain will keep reconnecting with all your negative emotions, and you will feel them all over again. The brain doesn’t know the difference between memory and imagination, so challenge yourself to think of a new way to tell your story, a way that means you are able to feel better. Start to notice how often you think about your ex, or mention their name. Every time you think or talk about them, you keep them in the forefront of your mind and the emotional ties are reinforced, so consciously notice, and make yourself think about anything else! 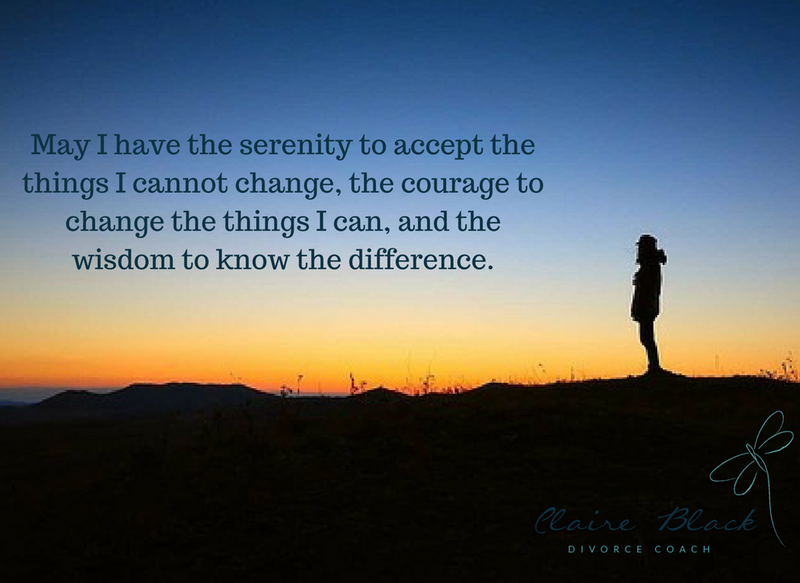 If where you are is causing you pain, and you would like to find out more about how I can help you to handle your divorce, and move forward positively, please get in touch! I would love to help you!